Page builders have completely changed the way we build pages for our website. Many WordPress users had problems customizing theme pages and weren’t able to get into the technical stuff. But with page builders in the picture, everything has become so easy. You can easily drag-and-drop elements to create beautiful pages. There are so many features available in page builders that now you can bring your desired page design to life. The market of Page builders has gained popularity over the recent years. With Visual Composer being the industry leader, there was no other page builder in competition. But times have changed now and so have the requirements of WordPress users. Today, there are so many awesome page builders available that it’s hard to choose the perfect one. To help you choose your perfect page builder, I have created this list of 10 best free and premium page builder WordPress plugins you should be using in 2019. I have explained in detail about every page builder so that you can choose the one based on your requirements. Formerly known as Thrive Content Builder, this page builder WordPress plugin provides you a WYSIWYG (What You See Is What You Get) functionality to build pages. Thrive Architect is famous for its simplicity and the user-friendly editor. This page builder can do wonders for you if you’re an online marketer as it provides many conversion-focused templates. What makes it even better is that the elements provided in Thrive Architect are also conversion-focused allowing you to generate more leads. You can create homepages, landing pages, blog posts, long sales pages, and product launch pages using Thrive Architect. The plugin is also responsive and you can instantly preview your pages for different devices and make changes specific to different screen sizes. Thrive Architect also makes the process of building pages fast so that you don’t spend most of your time in building pages. Integration With Over 15 Email Marketing Services. Many different content elements and modules. Create and save your own templates and elements to use on different pages. 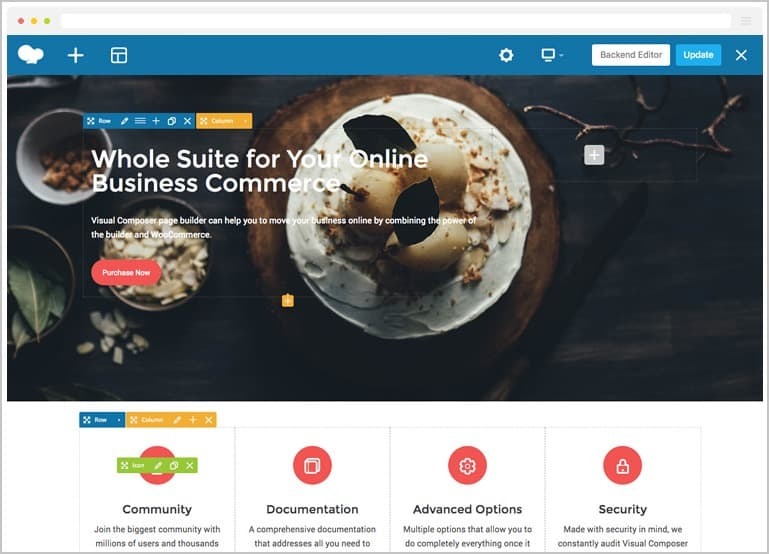 Thrive Architect comes at $67 for a single-site license. To use it on 5 websites, you can get the multi-site license which costs $97. Thrive Architect also provides a 15 site license which costs $147. You will get all features in every license you pick. Divi Builder is the page builder that focuses on aesthetics more than conversion. You can create stunning pages for your website using Divi Builder. It works on any theme seamlessly and you can design pages hassle-free. Divi builder comes with 46 content modules that can be used to build pages. Apart from this, it comes with 3 section types and 20 row types to provide endless design possibilities. You can customize almost every aspect of any element in Divi Builder and also add custom CSS. What I love the most about Divi Builder is that you can save layouts and elements and import them to other pages with ease. You can duplicate elements and even disable them to hide it from the front-end. Divi Builder comes with a feature called global items which makes your page designing process simple and saves a lot of time. What it basically does is that you can set an element or a column as global. Now, whenever you edit that column or element, the changes will be made to all the pages where you have added that column. Lock and disable elementsCopy & page elements. Control column and row spacing. Offers backend editor along with front-end editor. Save items and templates to your library. Cannot add modules outside Divi Builder. Will have to buy the entire Elegant Themes package to buy Divi Builder. Divi Builder comes with the Elegant Themes package. You can either get the yearly access which is priced at $89 per year or go for the lifetime package which costs $249. Both these packages provide all the themes and plugins offered by Elegant Themes. ​WPBakery Page Builder was formerly known as Visual Composer and is one of the first page builder WordPress plugins. It’s a drag-and-drop page builder and also provides back-end editing. It works on any WordPress theme and comes with many templates and elements. The best feature of WPBakery Page Builder is that it provides addons. There are many addons available that make the builder even better. It also comes with a skin builder to allow you to design your own elements that match your brand identity. 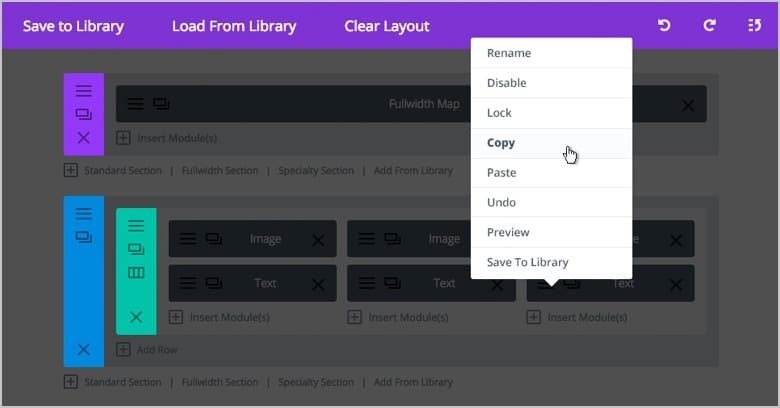 The template library consists of hundreds of templates designed for different purposes This page builder plugin provides builder API which allows you to create new content elements with ease. The plugin is fully responsive and supports multiple languages. You can purchase WPBakery Page Builder for only $45. This plugin can be used on a single-site and comes with free updates and premium support. You can also get the extended license which costs $245. ​Elementor is one of my favorite page builder plugins and it’s probably one of the best page builder plugin you’ll ever use. One thing that sets this WordPress page builder plugin apart from others is that it’s completely free. It’s a fast drag-and-drop page builder and is very easy to use. You can use it on any theme and any page you want. It gives you full control of customization of columns and rows. Elementor provides many predesigned templates that you can use for building pages. You can also save your own templates and even import or export them. Elementor comes with a ton of elements that can be used to design stunning pages. It offers over 400 icons that can be used for designing pages. It also provides 800+ Google Fonts so you can control the look of your page. The plugin is mobile-friendly and allows you to change the design of your page for different screen sizes. It supports multiple languages and RTL pages. You can create custom CSS for your pages. Elementor is available for free. The free version provides all the basic features provided in a page builder. In the pro version which costs $49 for 1 site, you get all the features including updates and support. You can also get the business license which is priced at $99. You can use this license on three sites. And if you want to use Elementor on unlimited sites, you can purchase it for $199. Beaver Builder is another page builder plugin for WordPress. It also comes with many gorgeous pre-made templates and designs. You can save your own templates too. It supports live front-end editing and is fully responsive. Beaver Builder provides widget and shortcode support. The plugin supports pages, posts, and custom post types. You can save modules and use them on other pages. The starting price for Beaver Builder is $99 which allows you to use it on unlimited sites. The plan goes up to $399 which includes Beaver Builder theme along with the plugin. Themify Builder is a page builder plugin for WordPress that offers both back-end and front-end editing. It comes with 40+ predefined layouts and templates that you can import in a single click and use. You can also save your own layouts and modules and import/export them. You can build many possible combinations of rows and columns. Regardless of any combination, the plugin is fully responsive. Another great feature of Themify Builder is that it offers animations for elements. There are 60+ unique animations available in the library for use. The customization features for elements are also very good. The plugin is compatible with many 3rd party services. Some of these services are WooCommerce, Mailchimp, Disqus, Jetpack, and Yoast SEO. Lastly, Themify Builder provides extendable addons that can be installed to make your pages look even better. Themify builder costs $39 but you can also get the lite version of the plugin for free. This free version doesn’t include most of the features of the plugin. The Beaver Builder bundle costs $59 and includes all the extendable addons along with the builder plugin. SiteOrigin Page Builder plugin is a free responsive page builder plugin for WordPress. It’s a front-end editor but not like Thrive Architect, Divi or Elementor. It works with any theme and provides widget support. You can undo/redo your changes. The plugin allows you to set your own styles for rows and columns. SiteOrigin Page Builder doesn’t come with many widgets but you can get more widgets with the SiteOrigin Widget Bundle. This includes many widgets that work seamlessly with the page builder. The builder is totally free but you don’t get enough to design a stunning page. Most of the elements you will require for building your page come as addons for the plugin that have to be purchased separately. 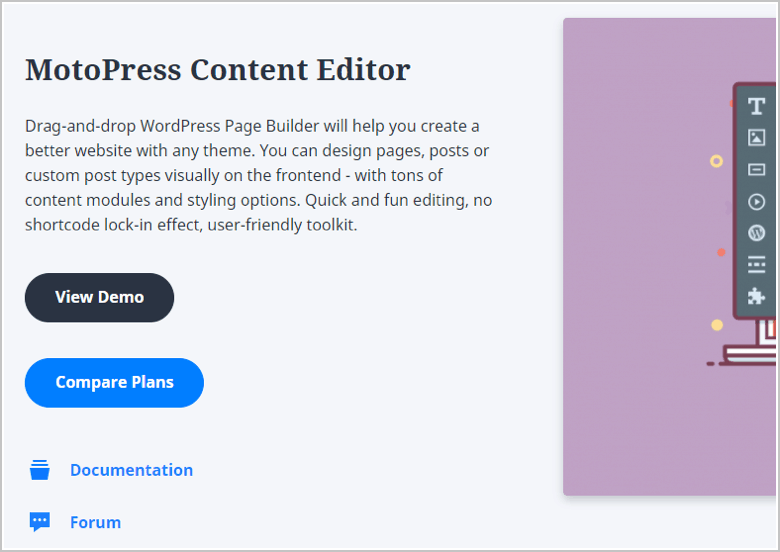 ​MotoPress Content Builder is a beautiful looking page builder plugin. It allows front-end editing and comes with many predefined layouts. The builder supports Google Fonts and multiple languages. It has a style builder which allows you to customize various elements according to your needs. Along with the builder, the plugin also supports different addons that can be used to further design your page. Though it doesn’t have many content elements except from the normal elements we see on page builders, the addons can help you create the page the way you want. The plugin is priced at $29 for a single site. To use on 5 websites, the plugin costs $47. But these plans don’t include the addons with the plugin. You can purchase the plugin along with the addons for $69 for a single site and $179 for unlimited sites. 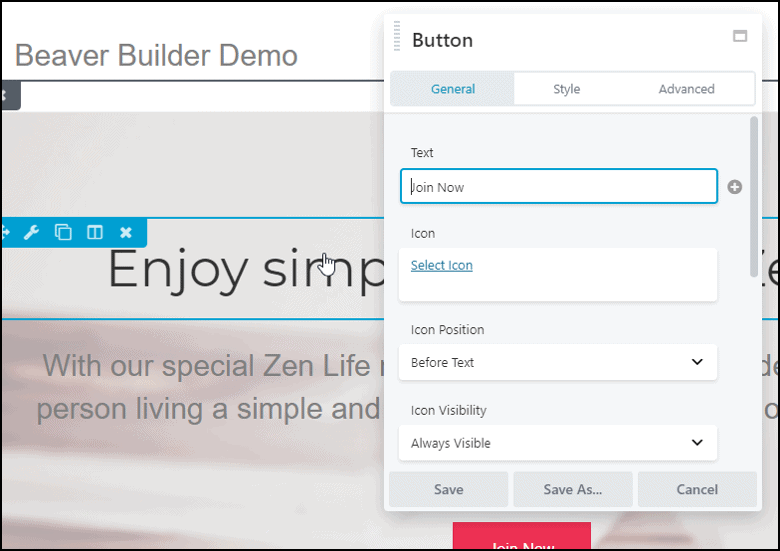 WP Pa​​​​​​​​ge Builder is a freemium drag & drop WordPress page builder developed by the team at Themeum. Whether you are a developer or non-technical person, you don't need to code or develop sites from scratch. By using WP Page Builder plugin, you can easily create and design your website. You can create excellent web pages effortlessly with a live intuitive page composer that requires no coding. This plugin offers you 60 blocks, 38 add-ons, and 27 layout packs that facilitate you to make things more interactive. This is a free front end based tool with plenty of design options which allows you to build your entire website most efficiently. The web pages created by the WP Page Builder is faster and smoother. Moreover, easy to use interface of the plugin makes a novice user very much comfortable to create pages of the site. Custom Font Styles and Colors. Drag & Drop Facility with Parallax Effect. Custom CSS with CSS Blend Mode. 60 Blocks, 38 Add-ons, and 27 Layouts. 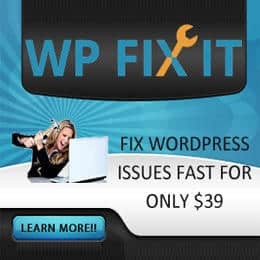 In pricing, WP Page Builder plugin starts from $39, you also can get the free version from WordPress.org. The free version includes the basic features of the plugin. For the pro version, there is a bundle pricing that offers 20 themes and 3 plugins by the cost of $150. ​OptimizePress is an awesome page builder for marketers and entrepreneurs who want to build conversion-focused landing and sales pages. You can create funnel, training, and course pages. It is front-end editor which helps in making pages faster. The plugin is fully responsive. It comes with over 30 different templates and over 40 custom elements. The best part is that OptimizePress is compatible with many marketing tools like Mailchimp, KissMetrics, Optimizely, Aweber, Google Analytics, and more. You can also create membership portals with OptimizePress. ​OptimizePress costs $97 for 3 sites with all the features included. But you can get more features like A/B testing, page engagement features in the publisher and pro plans which cost $197 and $297 respectively. ​This is a fairly new page builder WordPress plugin. 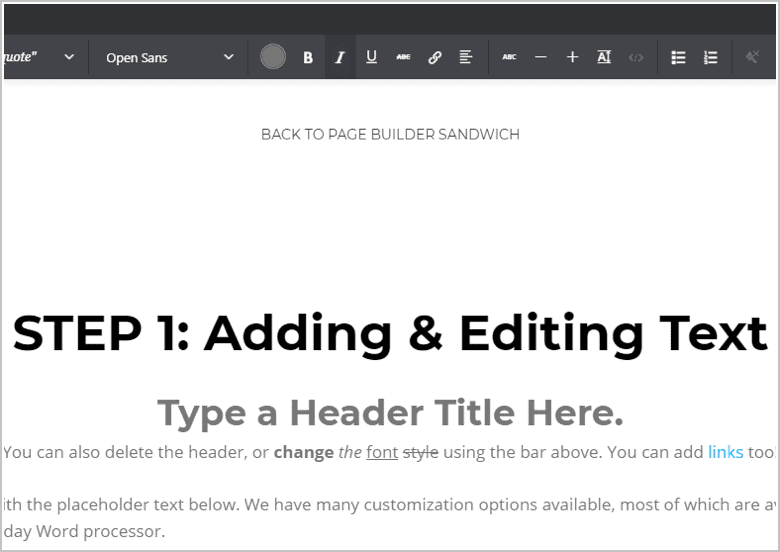 Page Builder Sandwich is a front-end page builder plugin and you can directly type to edit your text. But you can still use the back-end editor if you want. The plugin is fully responsive and supports Google Maps in the builder. You can also use widgets and shortcodes to create better pages. It provide vector icon support to add high resolution icons to your pages. The plugin comes with many different templates and predesigned sections that you can directly load in your editor. It integrates smoothly with 3rd party services like WooCommerce, MailPoet, Aweber, Mailchimp, and more. The plugin’s user interface is very friendly and it’s easy to design pages. Page Builder Sandwich plugin is available for free but you can get the paid version with all the predesigned layouts and templates for $39 to use on a single site. The unlimited license costs $89. ​Conclusion: Which Page Builder Is The Right For You? So these were the 10 best (free & premium) page builder WordPress plugins. Now, to choose one from these 10 can also be a daunting task as all of them are great. To help you make this decision, here is an overview of what builder to choose for what purpose. Thrive Architect is the best page builder if you want build pages to improve your conversion rate and generate more leads. Elementor or Thrive Architect is my personal recommendation if you want to create pages that look visually appealing. This boils down to Divi and WPBakery Page Builder. Both allow you to edit pages in the back-end and the front-end as well. The front-end interface of Divi is much better than WPBakery Page Builder which gives it an edge over it. This one is difficult as all of them come with pre-defined templates. But I would say Thrive Architect, Divi, Elementor, and Themify Builder have the best pre-defined templates and it’s your job to check their templates and choose the plugin which has the best templates according to you. Thrive Architect and Elementor allow you to set global elements. Anytime, these global elements are edited, the design of that element changes wherever it is added. This way you can control the look of your elements on all pages and maintain a consistent brand image. Elementor is the best free page builder WordPress plugin you should be using if you don’t want to spend money in purchasing a page builder. Thrive Architect wins the award of the best WordPress page builder in the market. It offers everything a page builder could offer. What makes it the best is that it’s very easy-to-use and you can do anything with it. 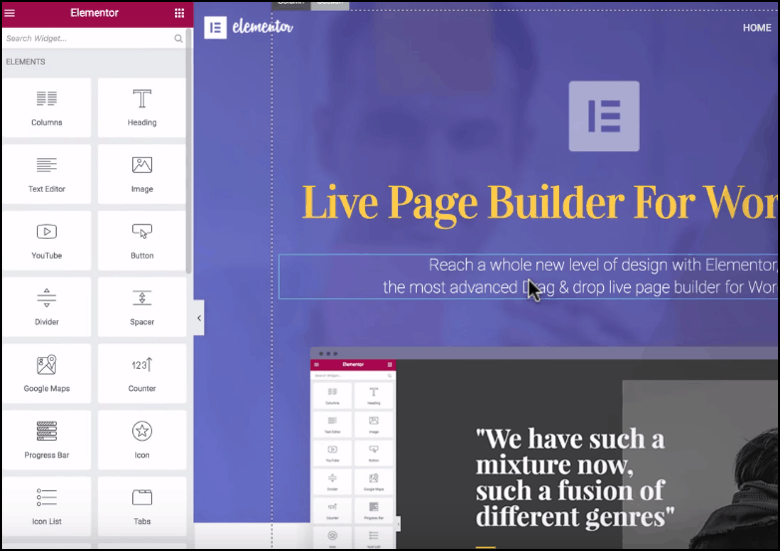 So, if you’re looking for the best page builder, Thrive Architect is the answer. Now, it’s your decision to choose the page builder that fulfills all your needs. Before choosing any page builder, make sure you check all the features available and whether it’s exactly what you want. This post is designed with Thrive Architect. 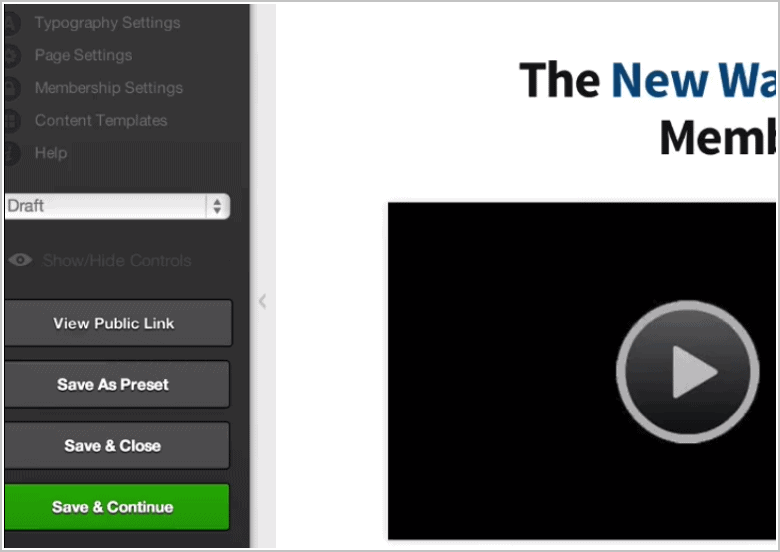 It's the best "Drag & Drop" Visual Editor for WordPress. Creating beautiful and engaging blog posts has never been easier as it's today because of Thrive Architect.